Experience the beauty and grandeur of the early 1910s at Long Bar at Waldorf Astoria Shanghai on the Bund. : The Shanghai Club's famous "long bar" has been re-created from archival photographs on the lobby level of the Waldorf Astoria Shanghai on the Bund, bringing a sense of the beauty and grandeur from the early 1910s. 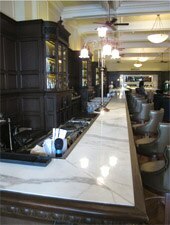 (The original was once touted as being the longest bar in the Far East at more than 100 feet of mahogany wood.) Long Bar attracts expatriates, visitors and locals alike with its elegant ambience. The menu features caviar and oysters (flown in from France), as well as salads and sandwiches. There's a lengthy list of spirits and drinks that includes classic cocktails from The Waldorf=Astoria in New York. Cuban cigars are also available.